For as long as I can remember I have always been intrigued by the innovative modernization and the esoteric nature of Japan. My first fond memory in my early childhood was that of the grand sumo wrestlers in giant underwear from the before school airings of The Wide World Of Sports. As I got older the whole business of kneeling while eating, raw fish as a delicacy, bowing as a greeting to strangers, saving face, and taking your hat off for elders encouraged me to learn more about Japan. I initially thought the book was titled Precocious Japan, which in a sense is categorically correct, but could lead to a drastically different reading experience. My initial expectations were that this was going to be a fun, lighthearted read talking about how Japan is a trend-setting super power that I already knew that it was. Upon receiving the book I read the title (much to my surprise), read the first few pages to get a sense of what was to come, and realized that my expectations were vastly misguided. Let’s just say that the initial pages set a rather darker tone than I was anticipating. It brought back a comparable memory of when I was watching a Japanese movie called Jisatsu Sakuru. The movie starts with an after work/school assemblage of people on there way home. The camera focuses on a group of teenage school girls as they are laughing, talking on their cell phones, having a great time together with not a care in the world. Once the trains lights are in the background the girls step behind the yellow line and hold one another’s hands for increased safety. Boy was I wrong. Fifty four girls, all together throw themselves in front of the subway train and are killed instantly. That is when the opening credits start rolling, confounded and dismayed I look at my brother and ask him “what the hell is this?” He simply smirks, looks at me, and points to the screen, in bold lettering “Suicide Club” is splayed across the screen. Like my initial thoughts about the book as well as the movie, when Japan is being presented in a given way, what you initially see is not what you end up getting. This film is the sequel to Noriko’s Dinner Table which is discussed further by the Author in Precarious Japan. The current face of Japan is young, poor, homeless, and hopeless which happens to be a direct reflection of the harrowing future of Japan. Given this predicament afflicting Japan’s youth today, I came up with my own hypothesis for a social revolution. While reading all the sad tales of isolation, anxiety, withdrawal, depression, and futility I was speculating that in order for Japan to have a social rebirth among the barren youth, it would take what Berardi suggested in the book as “the deadening of life that occurs may also be, or inspire, a call for social revolution, or at least a soul on strike.” What proved to be true was that after the destruction of the 3.11.12 earthquake, tsunami, nuclear disaster, many of Japan’s youth found a purpose and gave their life meaning. 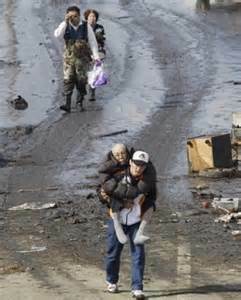 You always hear about an individual having to hit a “rock bottom” in order for a change to be made, let’s hope for Japan’s sake that 3/11 was theirs. On a less dismal slant, I really believe the Nippon Active Life Club’s social endeavour the “Time-Savings System” would provide purpose for Japan’s lost youth while aiding the elderly who, without support would be just another unidentified number in the long list of “hodukushi” (lost elderly). I remember watching a Japanese Movie called Kiraware Matsuko No Issho or “Memories of Matsuko” and really feeling like I was being introduced to various aspects found within the culture of traditional/modernized Japan. From sibling rivalry for a father’s attention, abandonment issues, the persuasion of JPop, and the fact that women without men will go through great anguish in order to secure a relationship. One of the main themes of the movie was that throughout her life Matsuko never felt at home and was forever in search for a “oneric” home, that while living she would never find. 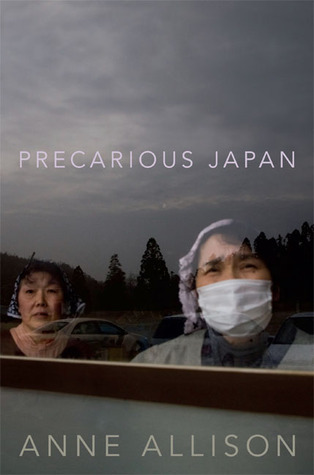 After reading Precarious Japan I know understand the Hikikomori (social withdrawal) and Zetsubou (despair) elements found within the movie that I merely shrugged off during my first viewing. Most importantly, I remember how sickened I was at the ending, but unfortunately it has become more clear as to the causation of why it happened. This book was very informative about the past,present, and future aspects of Japan. For me it was also gravely shocking. I have always lived with the assumption that Japan was always a few steps ahead of the rest of the world, in part due to their many technological advances in the automotive and electronic markets as well as the effervescent nature of their public. Upon reading this novel I get the feeling that “Big Japan” just doesn’t understand how important the psyche of the people is, and how it is a direct reflection of the actions of the government and the future state of Japan. I recommend this book to anyone looking to learn more about the in depth issues facing Japan not only today but in the future that is indeed very uncertain. Despite Precarious Japan’s penchant for various labour market statistics, political platforms, and micro/macro economics it is quite accessible for the reader if given the correct diligence and composure.